Prelude to my next 3 blogs: in the last months, I have been very moved by stories and workshops that have made me think about my personal journey toward Truth and Reconciliation. Since I work with youth, who must continue the journey for all of us toward Truth and Reconciliation, I want to provide families striving to do the same with some tools and reflections that they can use in their journey. This is the first reflection. I have just had my second opportunity to participate in the Blanket Exercise. 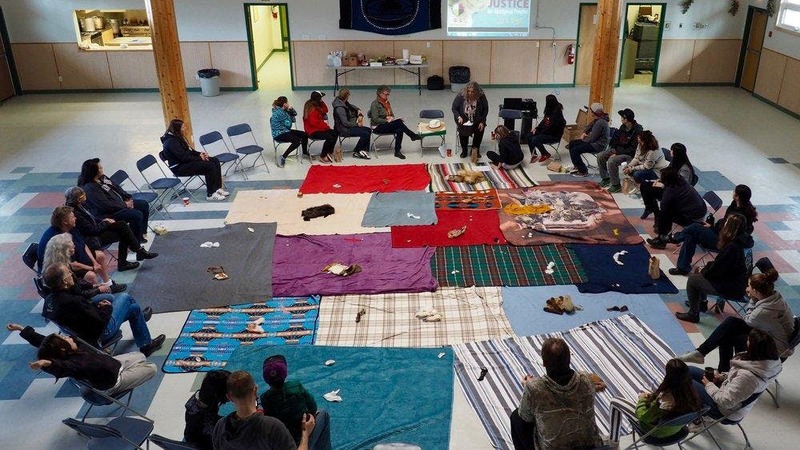 The blanket exercise is an interactive activity that facilitates an understanding of how the colonialization of the land we call Canada affected indigenous peoples. In the exercise, all participants except the facilitators are divided into groups placed on blankets spread on the floor of a large room. Each blanket represents the indigenous nations of this country on their traditional territory and the participants are the peoples of these nations. In the exercise, as settlers arrive in a territory, the various indigenous peoples are crowded onto a smaller and smaller piece of the blanket. By the end of the exercise, some people have lost their land altogether and no longer exist (like the Beothuk). Others have been cast off to a much smaller territory, barely able to support the people on it. This short film, and its description of the Blanket Exercise on the Kairos website, will help you to understand how the exercise is conducted. The first time I participated in the Blanket exercise, I was astounded at its psychic power. As I became involved in the story, I became angry, unable to understand why people gave up their space on the blanket so easily. I was almost furious with those with me on the blanket where I was that I could not convince them to stand on the edges of the blanket so that it could not be taken from us. My reflection about this is that I have close personal friends who are Mohawk, members of the Haudenosaunee or Iroquois Confederacy. They have helped me to begin to learn about the Truth of the history of colonization and I believe that those persons I know, and events like the 1990 resistance at Kanehsatake, have shaped my view of how the Mohawk people must have reacted to settlers. Hence, in the Blanket Exercise, I stood firmly on my space and would not give it up. Another element in both exercises I have participated in was that, as the facilitators walk through the room at each juncture in history when land was taken, they use their foot to carelessly push the blanket into a smaller space. You can see this happen several times on the short video. Watch the carelessness and disrespect of the motion. To me it is symbolic of the disdain in which we have held indigenous persons and their nations and their land. Finally, each time I have participated in this exercise, I have been overwhelmed by the depth of sadness that it unleashes in me. I find that I cannot keep myself from weeping. I am worried that I will not be able to assist in Reconciliation because I am not even sure when I am acting with the privilege of a settler at times. I do show the short video of the Blanket Exercise to groups and encourage people to show it to children and youth. This is one thing I can do to ensure that the next generation will know the Truth of our shared history.